"The game is really not that complicated. You'll be amazed at how much you'll learn if you read a book on programming after playing the game. After playing a game a few times, people can do basic programming." Igor Kholodov, creator of the game c-jump. Igor kholodov talks about his board game, "c-jump" after lecturing at BCC Tuesday. Inspired by his young son, Kholodov created the game to teach basic computer programming. FALL RIVER - Igor Kholodov was a computer programming consultant busy with long days at work and little free time to spend with his 10-year-old son, Andrew. Kholodov noticed that at some point, his son became interested in his father's profession but had a hard time understanding the programming language. Kholodov looked in stores to find a game that he could use to help teach his son, but came up empty. Instead, he took the type of game he envisioned finding and turned it into a sketch of what would become his own computer programming board game. Kholodov, a 41-year-old who now lives in Braintree, spoke Tuesday to a group of business and computer information systems students at the Jackson Arts Center lecture hall at Bristol Community College. Computer programming might become important enough in the future to be included in college admission standards, he told the students. "Software design is an art, not just a science," Kholodov said. A lot of books on computer programming are like "a chemistry book missing the chapter introducing the periodic table." His board game, called "c-jump," is simple enough that it is intended for children as young as 11 who "have absolutely no problem grasping the concept." In fact, Kholodov has heard from a father from Singapore whose twin 7-year old sons have learned computer programming through the board game. "The game is really not that complicated," he says. "You'll be amazed at how much you'll learn if you read a book on programming after playing the game. After playing the game a few times, people can do basic programming." Humans best learn new things by doing them, Kholodov said, telling the story of a skilled skier who asks a group of extreme skiers how to learn their style. One of the extreme skiers, who would more likely take off down a steep mountainside than speed down a slope, gives him a two-inch-thick hand-written manual to read - or he could simply learn by doing it, he said. Kholodov admitted to the students that players could get a little lost in the beginning, but will quickly learn about simple programming codes like "(x == 1)" or "x++." This type of code is used in C++ or Java programming. 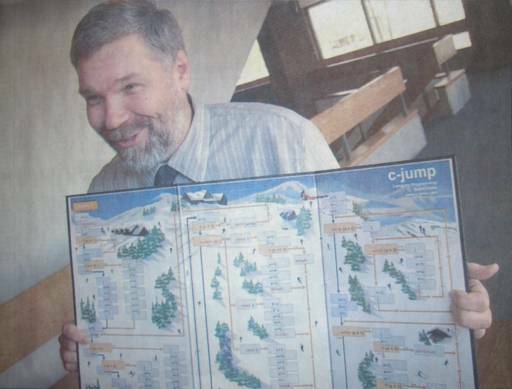 C-jump involves players skiing (a favorite hobby of Kholodov's) down a slope, rolling a die and landing on different boxes of code. Each code advances the skier to a different spot on the board. "X" is the number the player gets after rolling the die. A two-player game takes about a half hour. The game is available on www.c-jump.com for $24.95 or at The Games People Play, a board game store in Cambridge. Kholodov spent six years developing c-jump, which debuted in 2005.The games are made in Allegan, Michigan. The game has sold in Australia, Great Britain, Brazil, Canada, Chile, China, Finland, France, Germany, Italy, Japan, Malaysia, Mexico, New Zealand, Spain, Slovenia, Ukraine and other countries, Kholodov said. Free downloads of the board game virtual tour and a C++ Standard Library Tutorial are available on the c-jump Web site.